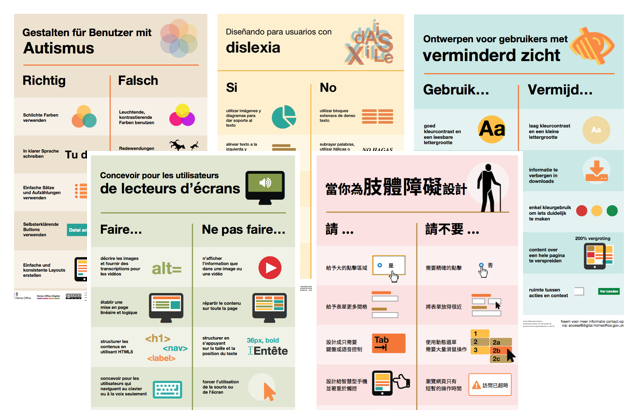 The posters are a way of spreading knowledge about accessible design in government. We've shared the posters on GitHub and Twitter and the response has been great. On GitHub we've had more than 5,000 views, the posters have been ‘starred’ 678 times and forked 64 times. On Twitter, we've had more than 10,000 impressions. Teachers in Germany have engaged with the posters, as have staff at the City of Philadelphia Office. Many people have printed them off to share with their teams, while others have used them as educational and outreach materials as part of their campaigns. We’ve had questions asked and many suggestions offered on how they can be improved, with lots of recommendations of how we can add to the series. Then there were those who took the time to translate the posters so they can be understood and shared in other languages. We’ve had requests to translate them internationally. On GitHub, they've been translated into 5 different languages so far: German, Spanish, French, Dutch and Chinese. We’ll be discussing the posters at an open-source software development conference in Belgium on the 4 and 5 February 2017. We’ve also had feedback from Ethan Marcotte, a pioneer in responsive web design, who’s invited us to discuss the posters in a podcast. It's got us excited and thinking about other ways we can engage with audiences about what we do at the Home Office. We’re going to park the “Dos and Dont's” series for a while as we look into ways of approaching other aspects of accessible design. We'll keep you informed on our progress. Karwai I remember seeing these around 2MS and when I moved department, the first thing I did was print them for my new team. That they've been translated and shared so widely is awesome! Thanks Darren. We were surprised too by the uptake. Since this is not for profit, but to inform developers and public servant, are we allowed to use your material?